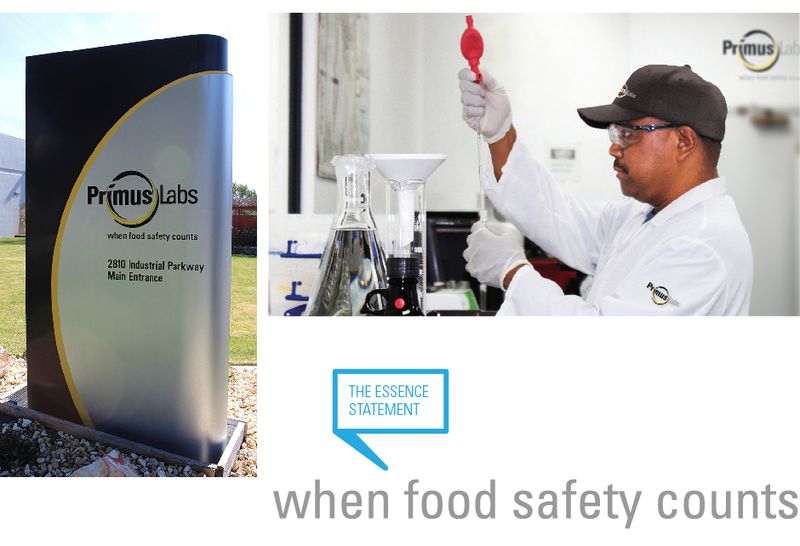 PrimusLabs is a global leader in food safety based in California’s Central Coast. In 1998, Primus Laboratories requested assistance to assess its overall brand message. CrossRoads Studios conducted an in-depth Strategic Brand Analysis. Based on the results of the Strategic Brand Analysis, Primus Laboratories initiated a thorough brand initiative. Consequently, a total brand overhaul was implemented, including logo, tag line, brand identity and implementation. Interviews: To gain insight into the food safety industry, CrossRoads Studios conducted extensive one-on-one interviews. Interviewees included the president/CEO, select board members, employees and food safety partners. In addition, there were interviews with the U.S. Food and Drug Administration (FDA), U.S. Department of Agriculture (USDA), Produce Marketing Association (PMA) and forward thinking retailers, such as Ralph’s in San Diego. Also, select interviews included tours and audits of field locations, cooling and packing processing facilities, along with retail stores. These meetings took place in Washington, D.C., California and Baja, Mexico. Industry Research and Competitive Audit: CrossRoads Studios reviewed numerous publications, including the FDA and American Dietetic Association (ADA) food safety reports. In addition, marketing materials and trade publications provided critical context and information. Another aspect of the research involved Primus Laboratories’ visual touchpoint samples. These included all marketing and promotional materials, such as stationery, product packaging and advertising. Also, a preliminary interior, exterior and vehicle signage audit was conducted. Before the Primus Laboratories’ brand identity was lost in an agricultural “green” crowd. This was transitioned to a brand that boldly embodies its powerful industry leading insights and safety messaging focus. As a result of experience and based on the analysis conclusions, CrossRoads Studios saw major opportunities to clarify and strengthen the Primus Laboratories’ communication and marketing programs. CrossRoads Studios could position Primus Laboratories to maximize the “value added” aspect of the Primus/client partnership. 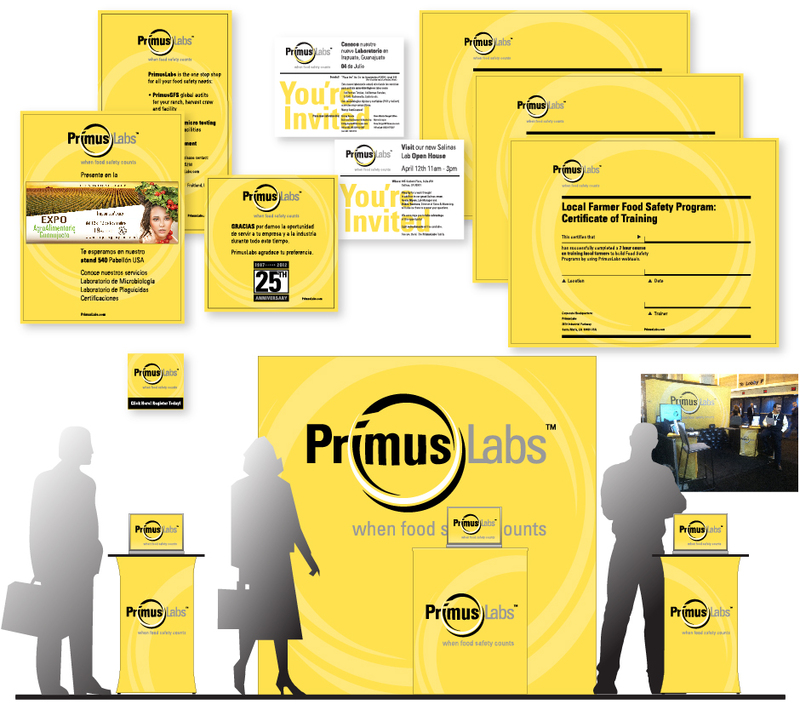 PrimusLabs initiated a total brand identity overhaul, including name, logo, tagline and implementation. The new brand identity was applied to all areas, including digital, print and signage applications. CrossRoads Studios was requested to work with their team on a long-term basis to apply the client’s brand marketing strategy throughout all their communications. This included advertising (digital, print), collateral print materials (multilingual folders, brochures, inserts), email blasts and exhibit trade show booths with materials. Client support materials, charts and presentations were developed. CrossRoads Studios collaborated on the website and social media’s look and feel. PrimusLabs has worked with CrossRoads Studios for more than 16 years, and they have helped our corporate image mature along with our capabilities. Our brand image is a classic case study in transitioning from in-house brand management to one handled by professionals. We make sure that our clients’ testing and auditing services are carried out by specialists, and the same goes for our branding. Since that first consultation and years of collaboration, PrimusLabs expanded and diversified. 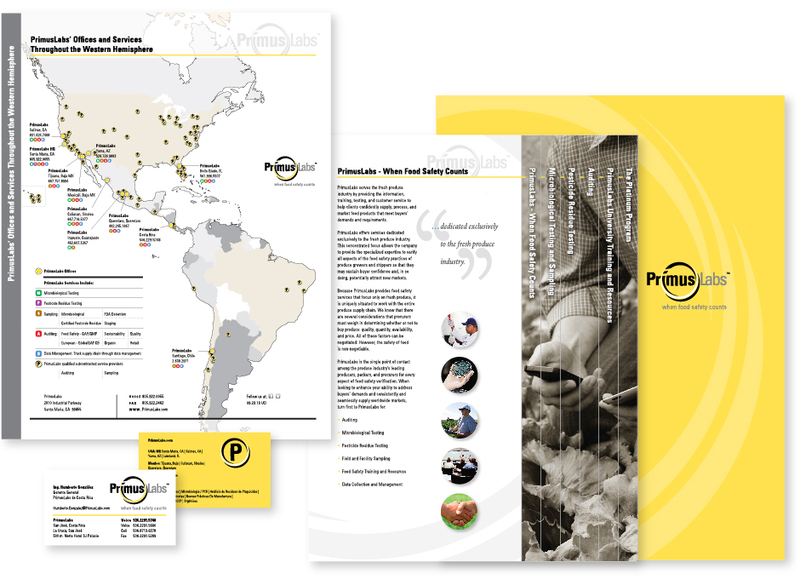 Most noteworthy, PrimusLabs is the largest food safety company in the produce industry, within the Western Hemisphere. 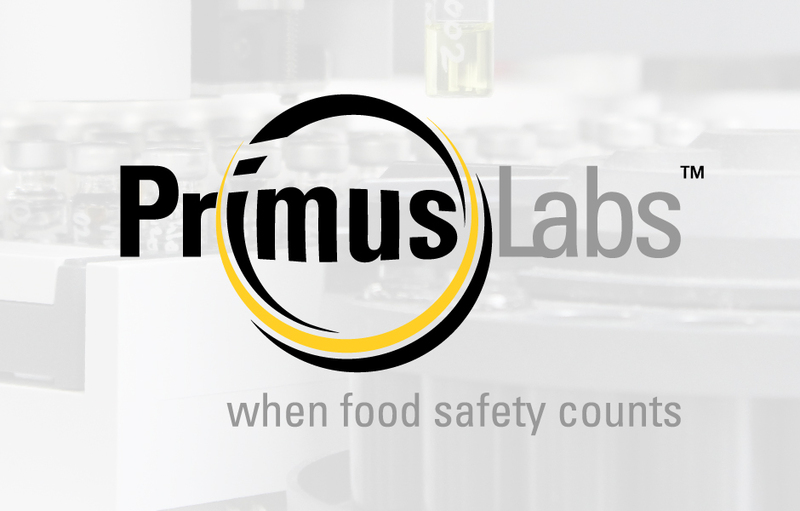 It is recognized as the gold standard for food safety services and as a result, the PrimusLabs website is viewed by thousands of companies on a daily basis. PrimusLabs is a leader in food safety for microbiological and pesticide residue testing, data management/analytics, consulting and audit scheme ownership. PrimusLabs utilizes state-of-the-art technology, degreed technical staff and QA oversight. Its services include data management, with its Azzule division, (but that’s another CrossRoads Studios’ story). CLIENT NOTES: PrimusLabs is headquartered in Santa Maria, California, with offices in Mexico, Costa Rica and Chile. PrimusLabs is a third-party auditing and testing company with programs covering the produce supply chain from growers to retailers. Their grocery retailers, food service and restaurant supporters include businesses such as Publix Super Markets, Schnucks Markets, Robinson Fresh, Sysco Corporation, Topco Associates, Darden Restaurants, Subway, Sonic Drive In, Markon, El Pollo Loco and Wendy’s International.